The new Hatco Electric Salamander is a model of efficiency and flexibility. It features the capability to cook, grill, reheat and keep food hot. You’ll also love how the upper hood is adjustable allowing for 4.5” of vertical adjustments. This gives you the flexibility to place an array of things under the salamander as well as to keep the heating mechanism the appropriate distance away from the product. The Hatco Electric Salamander has plate detection technology. The plate detection technology is great for energy conservation. This technology works so that the unit will stay off until a plate comes into contact with the plate detection bar. The high-powered infrared ribbon heating elements stay off unless triggered by the plate detection technology, or a cook or hold cycle has been activated. The salamander’s hold function has eight programmable heat levels, making it ideal for keeping food hot or reheating food. 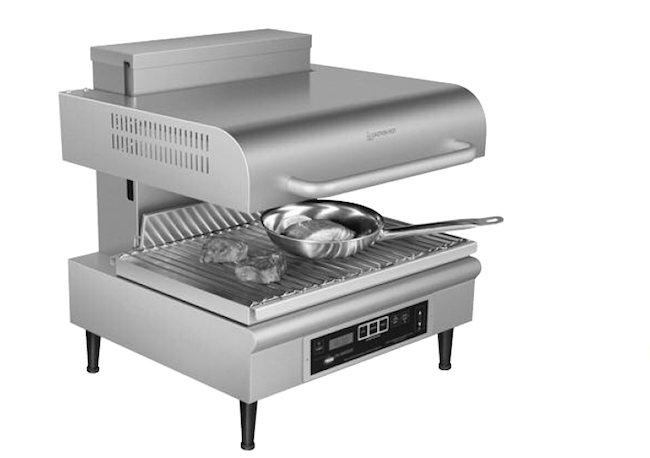 The unique features and flexibility make the Hatco Electric Salamander easy to operate, energy efficient and highly functional in any kitchen. For more information on the Hatco Electric Salamander visit HatcoCorp.com.